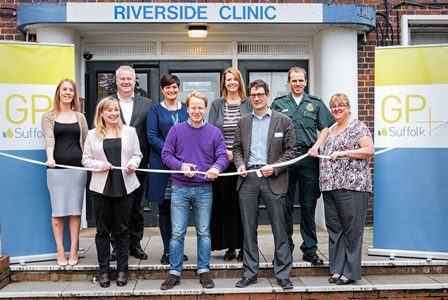 Ben Gummer, Member of Parliament for Ipswich and Parliamentary Under-Secretary of State for Care Quality, has officially launched Suffolk GP+, the pilot service which gives additional GP appointments on evenings, weekends and bank holidays. He visited Riverside Clinic in Ipswich to see the service in operation on Saturday 17 October and met the team of doctors, nurses and health care partners involved. People who urgently need a doctor’s appointment, or can’t see their GP on a weekday, now have access to additional appointments on evenings, weekends and bank holidays. Over 20,000 additional GP appointments will be made available over the course of the nine month pilot in Ipswich and Bury St Edmunds. The appointments can only be booked through the patient’s own local GP practice and are staffed by a rota of Suffolk GPs and Nurse Practitioners at Riverside Clinic in Ipswich (where the service is now open) and in Bury St Edmunds where the service will be offered from November. Suffolk GP+ is run by Suffolk GP Federation, a Federation of 61 GP practices in the county who work together to offer local community healthcare services while remaining independent practices. Fifty local Suffolk GPs and Nurse Practitioners have signed up to the Suffolk GP+ bank of doctors. They will continue to work for their own GP practices in the county while also working two or three additional shifts per month for GP+. In addition to the appointments being offered via local GP practices, Suffolk GP+ is collaborating with local hospitals and the ambulance service, to help ease pressure on Emergency Departments. Paramedics attending 999 calls have the option to contact Suffolk GP+ where the patient is assessed as needing to see a GP rather than go to A&E. The paramedic will call Suffolk GP+ first, before bringing the patient directly for an appointment. Patients at Ipswich Hospital (and West Suffolk Hospital from November) who are waiting at A&E and who are assessed as having minor ailments are also being offered an appointment with Suffolk GP+. The NHS 111 medical helpline and GP Out-of-Hours services are also collaborating with Suffolk GP+ to enable booking of some patients for appointments if appropriate. Suffolk GP+ is a pilot scheme running from October 2015 to March 2016*. *In March 2016, the scheme was extended for a further 12 months.